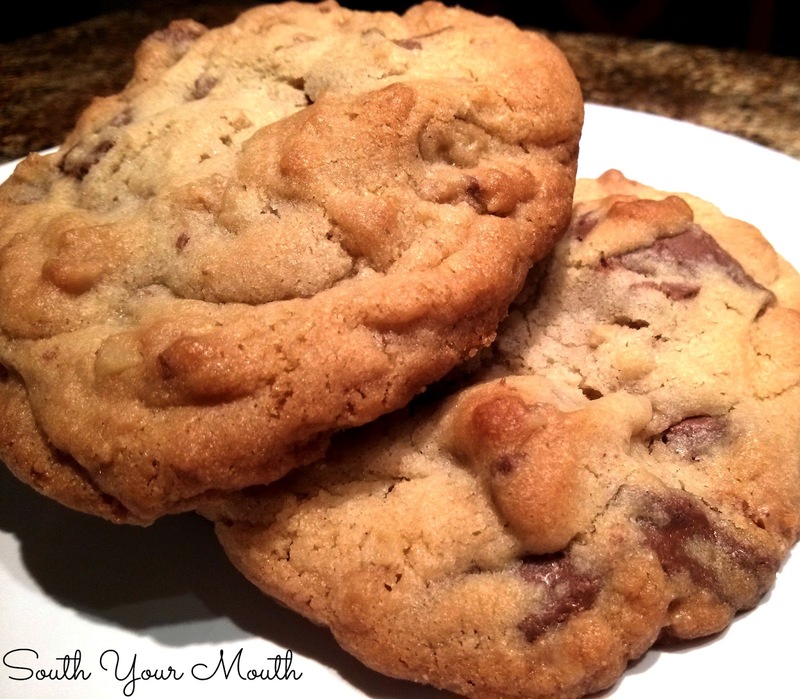 Chunky, chewy chocolate chunk cookies with milk chocolate pieces and toffee bits. This is the best chocolate chip cookie I've ever had. Ever. In my whole life. E V E R.
And you know what made them even MORE awesome? My friend, Dawn made them for me AND put them in a vintage lidded casserole dish for me to keep!!! I got home to find a pretty gift bag waiting for me. I looked inside and saw a covered dish with a note on top that read, “open me!”. I think it was like 10 minutes later before I remembered to look inside because I was so mes. mer. ized. by the olive green floral dish (WITH lid!). I sent her a message…. Me: I haven't had one of the cookies yet but they are GORGEOUS!!! Also? Don't count on getting your bakeware back!!! LOL! Thanks for the cookies!!! Dawn: The bakeware was your Christmas present!!! Ordered it for you from Etsy one time when you posted it!! Me: OMG! Are you serious!?!?! That's awesome! I was like, "What cookies? LOOK at this crock!!!!" Thank you!!!!!!!!!!! Dawn: Hope you like the cookies too!! Me: That's SO thoughtful! I'm headed to try on a cookie now! Me: OMG that was the best cookie I've ever eaten in my entire life. WHAT ARE THOSE??!?!?! Please, PLEASE can I have the recipe?!?! Me: Ask (Husband). I just said to him, "That's the best f@#%&*g cookie I've ever had." Combine flour, baking soda and salt in a separate bowl and stir to combine. Add flour mixture to sugar mixture and continue mixing until all ingredients are incorporated. Add chocolate pieces, toffee bits and nuts then stir to combine. Using a tablespoon**, drop rounded spoonfuls of dough onto an ungreased cookie sheet and bake at 375 degrees (335 if using a dark colored pan) for 9-11 minutes or until bottom edges start to brown. **I think Dawn used a boat paddle. These cookies were the size of my palm. And I’m 5’8”. You do the math. UPDATE: I have found that these cookies are best when cooked on a medium weight, light-colored stainless steal baking sheet. Dawn told me this but when I didn't listen and used my tried-and-true super dark pan, the cookies were flat and super chewy. And guess what she did? She bought me a pan like hers! I'm gonna keep her! These look quite amazing! I love a good choco-chip cookie! I made these last week and all I can say is,"thank you,thank you,thank you!" My husband and I ate all of them in 3 days. I didn't have a chocolate bar or walnuts so I used chocolate chips and crushed pecans. They were FINE...FINE...FINE!! You know how you always are on the search for the perfect chocolate chip cookie? Well, I have been for 20 years and I do believe I found it. We both agree this is our "go to" cookie for the rest of our life! LOL. Leanne, I just realized I never thanked you for this comment! I got so excited when I read it, the first thing I did was pass it along to Dawn :) Glad y'all enjoyed them! How many cookies does this make? If I wanted to split it in half would I scramble the egg and try to split it that way? I don't need too many cookies. My son is not a fan and it is only us. Oh snap! Girl! These cookies are AWESOME! I made these for a late night snack for hubby and he loves it!! I will surely be using this recipe in the future and many of your crockpot recipes. Thanks Mandy! Okay, I wanna make these babies ASAP!! But, do I really need the toffee? Thanx for your response. I don't know what else to say other than OMG these were AMAZING!!! I made them for a potluck and ugh they were fantastic! Thank you SO SO SO SOOOO much!!!! I just finished my radiation treatments and made these for the radiation oncology department to thank them. What a huge hit. These cookies are so delicious! Thanks for sharing! Congrats on finishing your treatment! Good luck in your battle!